Philharmonia incudes a full complement of woodwind, brass and percussion instruments. Philharmonia is a full orchestra, in the advanced division of YOBC. 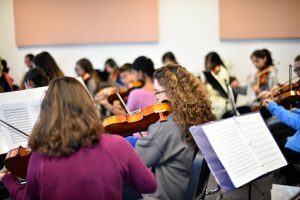 The orchestra provides a further opportunity for advancing string players to work on developing individual playing skills, ensemble rehearsal and performance skills, and overall musicianship. Within the Philharmonia repertoire, the mission of the orchestra is to strive to comprehend the creative intentions of each composer by artistically exploring the interpretive possibilities that lie within.